Many people can claim to be leaders, but they might be false leaders! Erroneous leaders display several characteristics. Sadly, many people are fooled into following these so-called leaders only to eventually be rattled. Here is a handful I’ve noticed over the years. 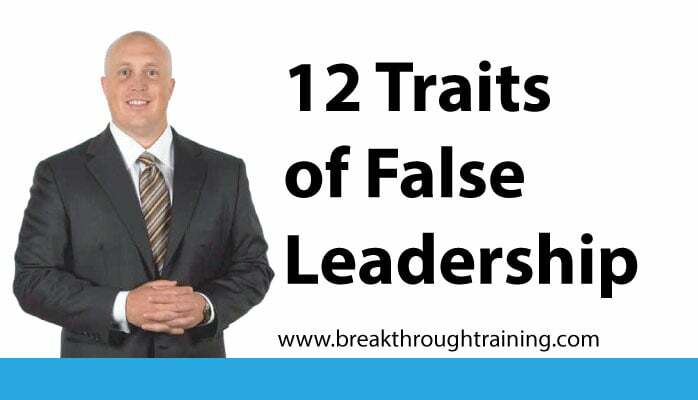 Let these characteristics be signals to recognize false leaders or when you might be acting like one. 1. Uses deception. False leaders practice the art of deception. These are the people you might know that are masqueraders. Misrepresentation is displayed in everything they say. What they do is the exact opposite of what is said. To avoid falling under the spell of this type of false leader, listen with your eyes not your ears. 2. Adorns a fancy title. Brian Tracy wrote, “Become the kind of leader that people would follow voluntarily; even if you had no title or position.” A leader that relies on title and not on performance is not a true leader. A real leader knows that he is only as good as his last performance. A fancy title should not gain trust. Many organizations assign big fancy titles to employees so that customers will deem them as important people to follow. False leaders ordain themselves with a shiny title to persuade you that they are worthy of your followership. 4. Attempts to control. False leaders think that people need to be controlled; that you need to force them to do something. Dwight D. Eisenhower shared, “Leadership is the art of getting someone to do something you want done because he wants to do it.” False leaders destroy people by attempting to control them. You can recognize a true leader because he wants to help you lead your own life. 6. Takes the credit. False leaders gobble up all the credit. A true leader acknowledges friends, peers and followers when they do a great job. Too often people don’t compliment others for their contributions. It takes only a few seconds to offer an accolade or a few kind words of appreciation. You are practicing solid leadership when you give credit when credit is due. A deep sense of admiration and respect is built when a person gives credit and compliments others. The opposite occurs when a person claims all the credit for him or herself. 10. Disrespects followers. As a leader, the only reason to look down on a person is when you are helping them up. True leaders appreciate their followers and hold them in the highest esteem. False leaders practice incivility, rudeness and insolence. How does it make you feel when someone disrespects you? Famous baseball player Jackie Robinson eventually gained respect and created a massive following that still lives on today. He did so by showing respect when he was disrespected. The only way to get respect is to give it. 11. Denies succession. Ralph Nader explains, “The function of leadership is to produce more leaders, not followers. To grow organizations current leaders much target and mentor people to succeed them. False leaders rarely engage succession planning for fear of no longer being seen as the leader. 12. Wastes time on personal vendettas. Using a leadership position to iron out a score or to get back at someone is an abuse of power. Time is best used solving issues and breaking through the challenges that concern your followers. Set aside your personal negative emotions if you want to be a true leader. You can now better identify when someone is practicing false leadership and not fall prey to it. Or when you might be employing these practices so you can eliminate them from your own habits.